When I was young, it was visible that I would always be short in stature. While that quality of being short was in my physical stature, it never was in my stature as a character. I had always wanted to please others and wanted nothing but for them to like me. Whether this desire to please and this search for love was due to my own physical deficiencies, I shall never know, but by the time I was old enough to understand other things in life, I was old enough to understand my physical inferiority. I do admit that being short developed in me an inferiority complex that wasn't bettered by other kids who were around. I dare say they were abusive and unkind to an extent that caused me bitter nights and utter self disdain. I had been shrewd with numbers, and that competence did nothing but add to the discrimination I faced from the other boys in the yard. I was a hard worker and would put myself through hell to give my best to a team I belonged to, but that was never put to the test as no one wanted to have me on their team. The years passed by and each day was filled with an incident or two where I was rejected and mocked. I remember one time when I had been given many figs by my parents to take to school and I had wanted to share them. Having offered the other kids some, they turned me down, but to top it off, just when I was about to eat one, one of the boys came and snatched it away from me. I wasn't too upset, and I reached for the basket to offer him some more, but I realized that the other kids had already reached for it and taken it. They ate some and played around with others and threw them on the ground. I cried that day, and I felt so much pity for myself, not so much for them taking away my basket but because they would rather fool around with what I offered than to accept it when offered from me. From that day onwards I decided never to have pity on myself and I decided that I would show them all. The hate I had for myself had surpassed all limits and had turned against the other kids. By time, as I realized I was not going to get treated any better ,my hate spread to all those around me, all those whom I suspected to mock me behind my back. I realized I was never going to be accepted, and I decided I had no need to. I no longer tried to hide my talent at school and aced all the exams, and I no longer cared for others' mockery or their affection for that matter. I was more and more determined to succeed without the help of others. Even while still learning I had learnt the secrets of trading, I had nothing to lose and so I took big risks and dealt with the buying and selling of many items, till I had more than most around me. When I'd grown, I became known to be rich and somehow all those who were around me started treating me differently since they were still stuck in poverty. I started lending money to people around me and demand great interest. I was found to be shrewd and so the Roman Empire deemed it fit for me to be a tax collector. I had no problems collecting taxes from all those around, most of whom had mistreated me. With time I had the power to collect money from everyone around, I would take more sometimes from those who reminded me most of the hatred that was directed towards me and the hatred I felt for them. I plundered, but their sorrow and desperation was never enough for me, for though I wanted them to suffer for what they did to me, what I inwardly wanted was for them to accept me. I still wanted their acceptance and I wanted their love, but I had not even admitted that to myself. The more I felt the need for others to love me, the more I hurt them and made them hate me. I was alone, entirely alone but it didn't matter because I had always been alone. It didn't matter that they hated me, because they always hated me. Then one day I heard of a great prophet that was passing through, a man of great deeds and ultimate kindness. When I heard that this healer was passing through, I screamed at the messenger, "yet another one of them who will preach to us our duties and point out our sins." Yet in my heart I had said, "if only he can heal this hatred." I saw him from afar, surrounded by crowds of people, swarming all over him. I could not see him properly, but I observed the parade as it moved forward. My height denied me any vision of what was happening and even my standing as a rich tax collector would not have any of the simple people give way. I looked at the path they were taking and saw a sycamore fig tree. I decided I must climb up to see who this so called compassionate and kind teacher was. In my heart I had hoped that this man would show to me or to people the sort of kindness I had only dreamt of as a kid, but in my mind I knew that there was nothing that would change. I struggled hard to get on top of that tree, and by the time I was up the parade had moved towards me. When the prophet had reached the spot, he looked up and said to me, "Zacchaeus, come down immediately. I must stay at your house today." Despite all my thoughts, my heart was filled with gladness. This prophet had stopped and chose me of all the people. 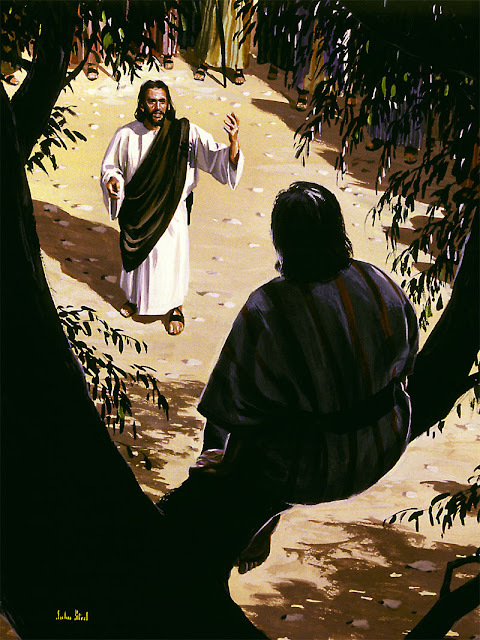 This man whom many swarmed around did not rebuke me and did not choose any of those others, but chose me, someone filled with hatred and darkness. I was overwhelmed with joy despite all my thoughts, this great man had chosen me. How had he known my name? How had he heard of me? I was close to tears but would not let it show. I was broken by his kindness to me, something I was rarely shown. The people were still unkind, and kept making references to how the prophet had chosen a sinner's house to go to. I knew I had shown them as much unkindness as well, and I had cheated them and hurt them, but they had shown me the same too. In any case, it did not matter, I was accepted by he who they seek approval from. I had forgiven all that had happened to me because I felt love from that man. I felt guilty for having returned their hatred with hatred. The reason I had gathered up all that money was to bring myself satisfaction through revenge, but the more and more I piled up and the more I cheated those around, the less satisfaction I got. I didn't care about money, I just wanted kindness, so I stood up and said, "Look, Lord! Here and now I give half of my possessions to the poor, and if I have cheated anybody out of anything, I will pay back four times the amount." The man who was called Jesus replied saying, "Today salvation has come to this house, because this man, too, is a son of Abraham. For the Son of Man came to seek and to save what was lost."